It’s a sunny Sunday afternoon and a small group sits in the dining room of Mezza Lebanese Kitchen, where a guide from Local Tasting Tours regales them with the sweet and spicy story of the Halifax donair. Moments later they are given samples of something a little more savoury, and the “oooh”s (“ewws”?) over the donair turn into “ahh”s as they bite into the real secret to Mezza’s success: the shawarma. Below the dining room, through a tiny maze of corners and doorways, sits a small prep kitchen custom fitted with stainless steel counters and sinks, and a low table where the rod from one of the restaurant’s three vertical roasters points hungrily at the low ceiling. The dull, choppy thwack of a knife echoes through the room as a prep chef prepares lettuce and tomato for a Greek salad. Tony Nahas emerges from the walk-in fridge with two 20-pound boxes of marinated chicken breasts. Nahas runs the Mezza Lebanese Restaurant Group with his brother, Peter. Their father, Elias, got the ball rolling with Tony’s Donair at the Halifax Shopping Centre in 1990. After rebranding as Venus Pizza, and now to Mezza, the future of the group is in the brothers’ hands. And Nahas feels that two generations in, if nothing else, they have finally mastered the art of shawarma. Now he’s wearing a chef’s coat and running four restaurants. In order to lock down the chicken for the shawarma itself, Nahas starts the process by impaling the first of 12 single chicken breasts on the vertical spit’s rod. 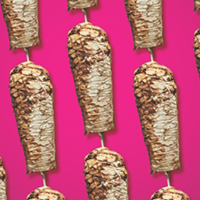 He slides the others down in a criss-cross composition that builds a tight foundation for the double-breasts that fan the tower out into the signature shape of the shawarma cone. The marinade sticks thickly to the plump chicken breasts, not a single drip to drop. By the time the cone is fully formed, there are 76 chicken breasts in the stack. Once it’s ready to shave down, this will actually be a relatively small serving, lasting only three or four hours of service. Up in the restaurant, Nahas puts together a classic shawarma wrap. He slides a large, round-tip slicing knife down a cone that has been whittled down to the core, slices of still-tender chicken falling like leaves from a tree. A second, untouched cone looms huge, a nearby tube of donair meat almost trembling with inadequacy. He adds the sliced chicken to an open pita with chopped lettuce, diced tomato, paper-thin dill pickles and fuchsia sticks of pickled turnip. “The garlic sauce is also very important,” says Nahas. “Other places will just use garlic granules and blend it with oil and lemon juice, or some people put mayonnaise in it.” He shakes his head. “Me and my brother travel and hit restaurants,” he says. “We went away a couple of months ago to Montreal and Toronto for four days and all we did was eat and eat and eat from shawarma store to shawarma store, just to see what they’re doing differently. And, actually, I think we’re on par with everyone, if not next level.” The next level for the Nahas brothers means taking their classic Lebanese menu items and putting some modern and international twists on them. 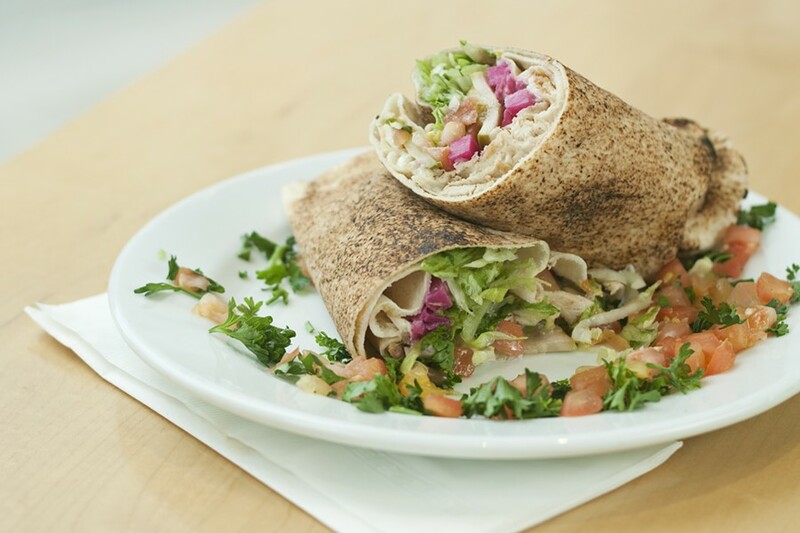 Like the Lebanese wrap, a favourite at Mezza: it has garlic, pickles and French fries. “In Lebanon, that’s how they serve them. So we go that idea there, and then we were like, ‘What else would be cool to do?’ You get people from Egypt and Saudi Arabia coming in, and each country does something differently,” he says. “In Saudi Arabia they’ll put ketchup, mayonnaise and garlic on it just with chicken and then a few fries.” That’s on the menu now, too. Click here to find the full Best of Halifax Hall of Fame.